A sermon preached at Christ Community Church in Rochester MN on April 6 and 7, 2019. If you’d like to watch or listen to the sermon click here. Today, we can compare the SOTM to a grand symphony with four movements that build upon each other. The first movement covers the Beatitudes and crescendos with the promise that those who surrender to the shaping of the Beatitudes will become salt and light in the surrounding culture (Matthew 5:13-16). In the second movement of this SOTM symphony, we find six reinterpretations of the LAW. Jesus makes six, “You have heard it said, but I say…” statements. With these statements, Jesus is diving into our innermost being probing the heart and raising the question of motive. Blessed are the poor in spirit… To enter into God’s kingdom, we are invited to admit that we have come to the end of ourselves and are in need of God’s help and care. Blessed are those who mourn… As we are honest about our own sinful tendencies there will be a transforming grief or repentance, that surfaces – not only for our own lives, but also for the injustice, greed, and suffering that grips our world. Blessed are the meek…Grieving over sin and suffering places us in a humble learning posture (disciple means learner). 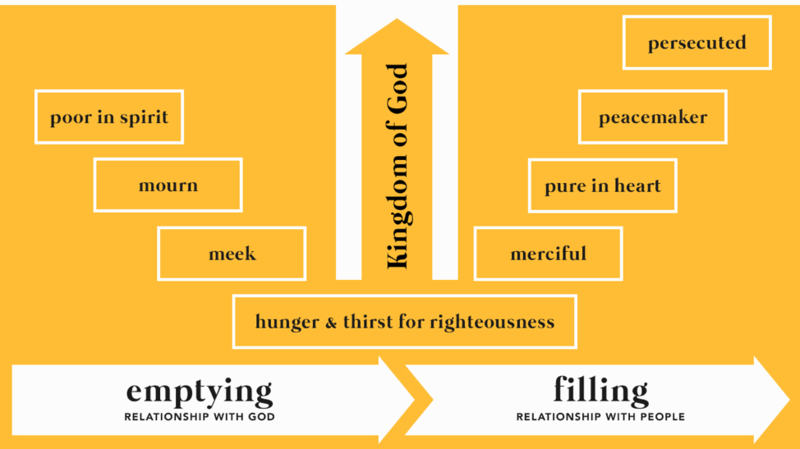 Blessed are those who hunger and thirst for righteousness…Spiritual hunger and thirst is the desire to be empty of those things that don’t reflect God and initiates a deep longing for wholeness in our lives (see Psalm 42:1). Blessed are the persecuted… Living life from a kingdom of God perspective will place us in conflict with those that oppose it (often times it’s “religious” people!). So, the goal in any conflicted situation is to respond with the mercy we’ve received, motives that are being purified, and promoting the peace of God. And then we get persecuted. Persecution is inevitable, this is how Jesus lived—and they killed Him. Roman forces had occupied Israel for about 40 years. The ruthless King Herod was a Roman “client” King of Israel and then his wicked son Herod Antipas replaced him. The legalistic Pharisees and scribes who placed heavy religious burdens upon the people. “If anyone wants to sue you and take your shirt, let him have your coat also” (v. 40) A working-class person often owned only one shirt and one coat. The vibe of this verse indicates that if a person is being sued unjustly, give them your shirt AND your coat, which in the 1st century, means you’re standing there naked. In Jewish culture, nakedness was not only shaming to the one who was naked but also to the one (or ones) who viewed the nakedness. This cultural perspective goes back to the Garden of Eden where Adam and Eve experienced shame when they saw their own and one another’s nakedness after the Fall. This action by the one being sued—giving up both their shirt and their coat, could startle the other party and cause them to settle the case quickly. “Whoever forces you to go one mile, go with him two” (v. 41) A Roman soldier could conscript a Jewish person to carry his pack, which weighed about 70lbs. but the soldier was limited to only make the conscripted person carry his pack for 1-mile. So, to go the extra mile would cause the soldier to fear the consequences of his superior if it appeared he was asking more than was allowed by Roman law. This would cause the soldier to deal with the conscripted Jewish person more humanely. It would also cause the soldier to wonder about the kindness that was offered to him. Stay in the Beatitudes. They are a spiritual formation process that will continue to challenge, cleanse, heal, and fill us. 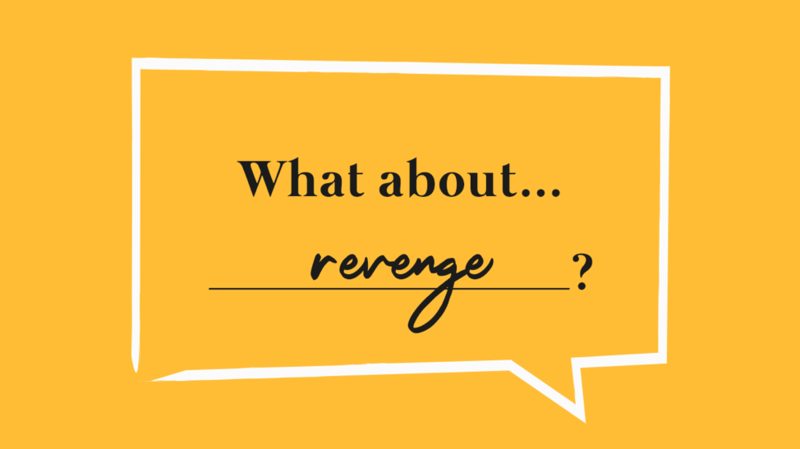 As much as we are able, leave “revenge” to God. God’s “revenge” is much different than ours. Leave the person to the care of God. The revolutionary teachings of Jesus in the SOTM are beyond our human capacity to “will-power” them into existence. Many have tried and all have failed. Jesus teaches that anger = murder; to refer to someone as a fool condemns us to hell; lust = adultery! The SOTM is not about exchanging one set of rules for another (thank goodness! ), rather it’s about trusting in what Jesus accomplishes on the cross to re-orient our values, our vision, and our habits from mere external righteousness to grace empowered change from the inside out. This is what we call the gospel. It’s not about what we do to please or appease God, it’s about celebrating what Jesus Christ has done. Theologians would say that salvation is granted by grace alone through faith alone in Jesus Christ alone. Have you received “the gift of God”? Have you rested from thinking (or believing) that salvation is the result of works? MLK. Stride Toward Freedom: 92. From a speech MLK delivered to the YMCA/YWCA at the University of California on June 4, 1957. Today is the first Sunday of Advent. The word “Advent” means coming and Advent is all about actively anticipating the coming of Jesus to establish the kingdom of God on earth. The kingdom of God was established with Jesus’ first coming and will be consummated at his second coming. Currently, we have a foretaste that is seen through the eyes of faith. Advent is anticipating His second coming as well as His first coming. It might be helpful to think of the Advent Season as a four-lane highway…One lane that is easy to get caught in is the commercialism lane. We can get sucked into overspending in an effort to keep up with family or friends that have more disposable income than we do. Another lane we can get stuck in, especially if you’re a type-A or a first-born, is the anxiety-riddled lane; wanting to make sure all the Christmas parties and family get-togethers are scheduled and well-planned and that packages sent reach their destination in a timely way. We can become an anxious presence instead of a non-anxious presence. Another lane is the depression and grief lane. Feelings of sadness for the people you have loved who have died or walked away. We don’t walk in denial, but also, we don’t let the feelings dominate. The lane we want to encourage you to travel in this holy-day season is the lane of quiet prayer, reflection, worship, and anticipation regarding the implications of the magnitude of God’s gift in Jesus coming down from the comfort and perfection of heaven and descending into our brokenness of humanity to make a way for us to become part of God’s family. To be sure, we all move in and out of the various lanes throughout the course of the Advent Season but what we’d like to do for these next few weekends (and Christmas Eve) is to provide a refuge for you, your family, and friends to move out of the commercialism lane, the anxiety-riddled lane, and the depression and grief lane and spend some time in worship, adoration, reflection, and anticipation of the gift that is Jesus Christ. My assignment for this weekend is for us to consider the relentless love of God through one of the Messianic Prophesies recorded in the OT. If you’re new to the Bible, there are about 456 verses (or sections) listed throughout the OT that accurately describe the who, what, where, when, and how of the promised Messiah. The late mathematics and astronomy professor Peter Stoner, who wrote a book entitled, Science Speaks calculated the probability of one person fulfilling only 8 of the messianic prophecies in the OT to be one in 10^17 = 1,000,000,000,000,000,000 to 1. Stoner concludes, “Any [person] who rejects Christ as the Son of God is rejecting a fact proved perhaps more absolutely than any other fact in the world.”—Peter Stoner  You might be thinking that is an outlandish statement?? It’s because of the sheer number and accuracy of the hundreds of messianic prophecies scattered throughout the OT that point to Jesus as the Messiah. Imagine a family at the park or, on a hike, and all of a sudden, a venomous snake slithers into their midst. One person goes after the snake and begins to stomp on it. Finally, the head of the snake is crushed and the family is saved, but only after the snake bites the one who did the stomping—and the poison goes into him, and he dies. That’s the picture. So, what is God saying here? The snake is not just a snake but is the Devil, or Satan, who represents pure, unmitigated evil. God is saying that one of the descendants of Adam and Eve, the seed of the woman, a human being, is coming and will destroy sin and death and, in the process, lose His life. Gee, I wonder who that could be? Gen 3:15 becomes the first Messianic Prophesy of the OT. What is truly remarkable about v. 15 is that as soon as Adam and Eve sin, God initiates a rescue plan. This is where we begin to get a strong sense of the relentless love of God. V. 15 is such an important verse it has its own word: protoevangelium, which literally means “first gospel.” Not only is this verse the first Messianic Prophesy, but it is also the first declaration of the gospel in the Bible. It is from this point forward the gospel of God’s grace and God’s rescue plan to bring about redemption in and through the Person of Jesus Christ becomes the central theme of the whole Bible. Another way to view it is as the organizing theme for the rest of Scripture and the rest of human history. And if this registers in your heart and in your head, it will change the way you read your Bible. You will begin to see the relentless love of God everywhere in the Bible as you read it. “Genesis 3:15 is the perch from which to view all of world history.” When we align the plan of God with the seed of the woman, we begin to see the reconciliation and restoration of all things begin to come into view. In order to get better acquainted with the RELENTLESS LOVE OF GOD, let’s go back and consider what just happened in Gen 3…Adam and Eve sin and destructively change the course of human history, but what does God do?? He doesn’t smite them, He doesn’t lose His temper, He doesn’t lash out…In the midst of this incredible disaster is this perplexing and intriguing response by God. God begins by asking some questions, “Where are you? What have you done? Have you done what I asked you not to do?” What is God getting at with these questions? Certainly, God already knew the answer to these questions. The only reason God would be asking these questions is if He’s seeking to provide an opportunity for Adam and Eve to own-up to what they’ve done. To say what they did. Own it. Take responsibility. But they didn’t do that did they? Adam blamed Eve AND God; Eve blamed the serpent. What we see here is God is treating Adam and Eve as adults. He’s not treating them as objects, He’s not treating them as children. He’s engaging in what people in AA or Celebrate Recovery would call an intervention. The bottom-line is that God is seeking them out in love. He knows they’ve sinned—and He still makes Himself available to them. But shame keeps them hidden from God and now, from one another. It’s important to see that God didn’t remove Himself from them, they removed themselves from God. Whether you woke up amazed by God’s grace and mercy or shamed by the worst mistake of your life, the single storyline of the Bible declares God’s relentless and unending love for you. Again, after a grievous sin God instantly quickly reinstates a rescue plan that is full of mercy and grace. It’s the same for you and me. Christmas is a time for giving. Not all gifts keep on giving, but there is one gift that is for everyone that does keep on giving. God sent His Son, Jesus Christ, as a gift to the World. Imagine with me for a moment…What if you lived in your house (or flat) with your family and it had no front door. And to make matters worse, there was no law enforcement to speak of – and bands of marauders would regularly descend upon your neighbourhood. How would that change the way you live? How would it change the way you slept? How would it change the way you work – or planned your day? That’s what it was like for the people who lived in the city of Jerusalem for several decades before Nehemiah came on the scene. The account of Nehemiah follows the humiliating defeat of the Jewish people by Babylon, the survival of a demoralized remnant in Jerusalem for 70 years, then their improbable efforts to rebuild the ruins of Jerusalem. Here’s what we need to see about Nehemiah as we prepare our hearts to allow the word of God to speak to us this morning: Nehemiah prefigures Jesus. Nehemiah left the comfort and opulence of the king’s palace to go and identify with, serve, and lead a bunch of broken and desperate people. Jesus did the same thing. He left the comfort and perfection of the King’s palace to step into the brokenness, desperation, and shame of humanity. Jesus is the better Nehemiah who came in obedience to the Father and out of love for the Father and laid His life down as a sacrifice for sinners to rescue us and spare us. We want to (always) acknowledge Jesus as the wise Rebuilder, primary Leader, and Senior Pastor of His Church. From the safety and security of the palace, we read in Nehemiah 1:3-4 that when Nehemiah heard his people’s “great distress and reproach,” that he wept, mourned, fasted and prayed for days on end (1:3–4). He took four months to pray, fast, repent on behalf of the sins of his “father’s house,” and to plan. He presented his plan to the king and secured both the confidence of the king (and queen – Esther??) as well as the resources to carry out his plan. Nehemiah traveled to Jerusalem and after some preliminary investigation and planning oversaw the rebuilding of the city wall and the gates in just 52 days. Stiff opposition was consistent throughout Nehemiah’s ministry in Jerusalem. They begin to study the Scriptures again and in hearing them expounded by Ezra (and the other priests), a deep and gripping repentance overcomes them. And as a result, they begin to experience revival. Takeaway: Repentance is the unlikely route to our joy. Chapters 1-6 describe the restoration of the wall and the gates of Jerusalem. Chapter 7 serves as a transition chapter. Nehemiah wanted to give credit to those who had returned to do the work during the crises. Chapters 8-13 describe the restoration of the people of Judah. In many ways, chapter 8 is the high point of the book and of the history of Israel as a whole. Why? God’s people were re-established as a people of the book. This meant more to them now than ever. The visible greatness of impressive institutions such as King David’s reign and King Solomon’s temple had disappeared. Only the promises of God remained. 8:1-8: God’s people re-establish the centrality of God’s Word. 8: 13-18: God’s people re-establish biblical patterns for regular (i.e., consistent) worship and study. 9:1-38: God’s people call for a Sacred Assembly as they re-establish authentic confession and repentance as a lifestyle. We can view these four points from Nehemiah as an overview of the transition season here at Bethany. We will take a quick look at all three of the four points this morning, but we will spend the majority of our time in Nehemiah 8:9-12, so I would like for us to read those verses now. 1. 8:1-8: God’s people re-establish the centrality of God’s Word. When they heard the Torah read the people began to repent, mourn, and weep (v. 9). God’s people were beginning to get back on track. The safety and security of the wall helped them to refocus and re-establish?? An important part of the task of VitalChurch at Bethany has been to take time to consider your past, your present, and your future. We have invited your input each and every step along the way… There has been a rebuilding of theological and governance systems – and more recently adding to the staff to nurture and disciple the young people in the church as well as reach out to those in the surrounding area. 2. *8:9-12: God’s people are re-established in the joy of the Lord, which became their strength. Within the safety of a rebuilt wall and a re-established governance model, the people witnessed the faithfulness and mercy of God and the people became emotionally safe enough to hear and receive the Word of God, which generated in them a deep and convicting repentance. How shall we define repentance? There is a gospel repentance that will repeatedly tap into the joy of our union with Christ in order to weaken our need to do anything contrary to God’s heart. Repentance is the first 4-Beatitudes (Mat 5): Acknowledging our spiritual poverty, mourning over our own brokenness and the brokenness of sin-sick world system, becoming humble learners, which result in a deep thirst and holy hunger to know and embrace God’s gift of righteousness. Repentance is Isaiah encountering the glory of God in Isaiah 6 — just walking into church one day and he encounters the glory of God. When Isaiah is in the glorious, exhilarating, and disturbing presence of God, honesty, confession, and repentance erupt out of his soul. Isaiah sees with disturbing clarity that his heart is sinful and incongruous with the weighty presence of God. Then, when he repents and confesses his sin God begins to explode into his life. Isaiah most likely thought the wrath of God was going to kill him when the seraphim picked-up the fire with the tongs and began to fly toward him. But instead of death, there was cleansing and healing. God’s holiness did not destroy Isaiah; it (actually) cleansed him. Isaiah’s self-image was deconstructed and reconstructed on the spot in the temple that day. Once we’ve had an encounter with God He becomes more real than our needs, personal preferences, and desires. And as we realize we are more sinful than we ever dared to believe, we simultaneously see that we are more loved than we ever dared imagine – and joy springs up in our hearts — and we surrender ourselves afresh into the service of the Living God. Repentance is the unlikely route to joy. To truly begin to understand joy we must distinguish it from happiness. The words happiness and happenstance come from the same root word. The prefix “HAP” means “luck.” So, we can say that happiness, like happenstance, is circumstantial. They come and go in life. Joy encompasses and transcends both happiness and sadness. Joy is like the sun, always shining even when night falls or clouds cover it. Happiness is like the moon – waxing, and waning. Christian joy is a deep and calm delight in the soul, produced by the Holy Spirit, as we encounter the beauty, majesty, and holiness of God in the gospel and we thus surrender our vain attempts to achieve happiness and contentment in our own strength. It was not the wall that made the returning Jewish refugees strong – it was finding their joy in God that became the basis for their strength. The joy of the Lord would unite them, encourage them, make them brave, and stimulate them to serve God’s purposes. 3. 8:13-18: God’s people re-establish biblical patterns for regular (i.e., consistent) worship and study. Until now, Nehemiah has been in the forefront. He was a gifted leader and administrator who could organize and mobilize people to get the wall built. But when it came time to teach the Word, he took a back seat to Ezra, who was skilled in the law of Moses. Ezra had set his heart to study it, practice it, and teach it (see Ezra 7:6, 10). These two men, along with the priests, illustrate beautifully the principle of team ministry. 4. 9:1-38: God’s people re-establish authentic confession and repentance as a lifestyle. What we see in this chapter (vs. 5-38) is the longest single prayer recorded in the Bible. It is a corporate prayer of repentance. Upon completion of the wall, the people gather together to worship and hear the reading of the Torah. In chapter 8 we learn that Ezra and other leaders preached and taught the Scriptures for an entire day, and after that, they came back to learn more. As the Word of God was read and proclaimed the people’s hearts were convicted as they realized that God had been faithful to them, but they had not been faithful to Him. This prayer is an expression of their desire to repent and return to their God. Chapter 9 is a sacred assembly — a time to come together and confess both corporate and personal sins. The wonder of the gospel that ultimately captures the wandering and wounded heart is that in spite of our sinfulness and selfish desires God sent His only begotten Son, Jesus Christ to die for us, and His Holy Spirit pursues us individually — and as a church. God’s faithful pursuit is not stymied by our anger or ambivalence, our lack of faith, or our refusal to trust. The only thing that will ultimately produce change and joy in our lives is recognizing our sin and receiving God’s grace. V. 20 is often used for evangelism yet please notice it is addressed to a church. There are seasons in the life of every church where the Holy Spirit comes alongside. To open the door is to recommit and return afresh to the leading of Jesus Christ as the Senior Pastor of the church. Adapted from Dan Allender, The Wounded Heart. This is Part 2. You can read Part 1 here. Part 1 is the theological undergirding and this blog will cover the more practical aspects of biblical conflict resolution. Conflict is inevitable. Embrace it. God will use it. Good Communication within the church conveys accurate information and gives an opportunity to correct misinformation. It is as necessary to the healthy function of a congregation as the circulatory system is in our bodies. Conflict is a normal experience in life. When conflict occurs, it demands prompt attention. Conflict that is not attended to immediately is like a neglected infection, and sooner or later it will engulf the entire organism. Sharing anything about someone, when the act of sharing it is not part of the solution of that person’s problem. Do not triangulate or allow yourself to be triangulated by another person. Triangulation is using “go-betweens” to communicate indirectly with other parties. The results are unsuspecting, but sympathetic message-bearers become entangled in an unwanted destructive web of blame, anger, and miscommunication. If you have questions or concerns learn the skills of asking questions and engaging in honest, humble, and prayerful dialogue – and go to the person you need to speak to. The problem with “taking up an offense” (which is a form of triangulation): Sharing our hurts and bitterness and listening to others share theirs is an area where we need to be very careful. For example, if someone is rude to your best friend and your friend “leaks” their hurt on you, then you might be tempted to “take up an offense” on their behalf; which means that you get hurt too. What can happen is that when your friend and the other person resolve their conflict — forgive and forget — you’re still bitter! Towards a definition of a “wise counselor:” Proverbs 11:14 declares, “There is wisdom in a multitude of counselors.” Sometimes “getting counsel” is merely a pretense for gossip. What are the criteria for a “wise counselor”? First and foremost a wise counselor is someone who is mature in the Lord and who will exhort you to godliness and reconciliation. Secondly, s/he is one who is willing to point out your sin in the situation, and who will not repeat the matter or be stumbled by it. And thirdly, s/he is one who is seeking God’s will over-and-above your desire/s. It should also be noted that we can pursue counsel without revealing the name of the person we’re having a problem with. This is the type of people we invite into either the formal or informal Matt 18 process. Some conflict is rooted deeply in the emotional system of a person’s life (Ex 20:5, 34:6-7; Deut 5:9). This must be kept in mind when attempting to reconcile a conflict. When in conflict ask, “What am I feeling and what is the conflict saying about or to me?” (Prov 15:1). Or ask, “What is behind this?” This is especially true when there is explosive behavior or deep emotional reactivity in the conflict. This is often related to family of origin issues. Keep short accounts in any conflict. When you need to talk to others do so in a reasonable amount of time. The goal of conflict resolution moves from forgiveness to reconciliation to restoration. The goal is not to prove you are right! Don’t violate the spirit of the law while following the letter of the law. Some conflict may only be resolved only by forgiving others. To forgive is to bear the wounds of another (see below) and not hold them accountable. To not forgive is to often take on the negative qualities of those who hurt you. Forbearance (i.e., patience, restraint, mercy) is a gift that we give to another. Some conflict may never be resolved. It a [person’s] glory to overlook an offense(Pro 19:11). Why do we become just like the people we hate? It’s a form or worship – intense focus. We become what we worship. Resolving conflict doesn’t mean that you let others trample godly boundaries (by continuing to hurt you) or by being a doormat or by not holding others genuinely and justly accountable for their choices that hurt you. When there are occurrences of “outbursts of anger” recognize that anger is a secondary emotion. We need to ask, what is the primary emotion? Hurt? Fear? Frustration? Own it and confess it. Practice the basics consistently: (1) Take the log out (Matt 7:5) (2) Go be reconciled (Matt 5:23-24) (3) Lovingly confront (Matt 18:15-18) (4) Restore (Gal 6:2). Sir Arthur Conan Doyle, the author of the Sherlock Holmes series in the late 19th century, played a practical joke on some of his friends. He sent a telegram to them that said only these words: “All is discovered. Flee at once.” Within 24-hours ALL of them had fled the country! Those were men with guilty consciences. They fled because they knew that they deserved punishment for something. How many people do you think suffer from a chronic guilty conscience in our world? Whether it’s chronic guilt or shame — our contemporary Western culture tries to account for this restlessness gnawing in our soul without taking into consideration the biblical doctrine of sin. We will be considering the line in the Apostles’ Creed that reads: I believe in the…forgiveness of sins. But before we can talk about God’s forgiveness, we will need to talk about sin. If you are new to reading the Bible, the words covenant and testament are very similar (a covenant is also a contract). The Bible has an Old Covenant/Testament and a New Covenant/Testament. What Jesus is doing in THIS verse is initiating the New Covenant (from Law to grace). Jesus, fully God and fully Man, has completed His miraculous ministry and perfect obedience and He’s having a final dinner and saying some final words to His disciples before He goes to the passion of the cross – and then the resurrection, where the New Covenant (or Government/Kingdom) will be established. Takeaway: The shed blood and broken body of Jesus establishes a new covenant between God and His people, with the central focus being the forgiveness of sins and access to a right relationship with God (see also Luke 22:20 and Jeremiah 31:31–34). Let’s begin with some definitions of sin…Probably, the most common definition (or description) of sin that most of us in the room are familiar with is: “missing the mark.” Think of a target or bull’s eye – and to miss the mark by even a millimeter is still to have missed the mark. And let’s be clear, none of us even comes close to the perfection, the majesty, the holiness, the wonder, the beauty of God. This is similar to the theological concept of the Doctrine of Total Depravity. It’s fairly easy to read words like lawless and total depravity and think, “Well, I’m not that bad!” (i.e., Hitler or Manson). Yet, the theological concepts of lawlessness and total depravity, are NOT saying that we are as lawless or depraved as we CAN be, it’s saying that we cannot reach the righteousness or perfection necessary to be in the presence of God. We’re lawless ENOUGH to miss the mark, we depraved ENOUGH to miss the mark. But have I ever told a racist joke – or laughed at one? Or heard racist talk and remained silent? Have I ever stopped to think that an African American father has to have a whole different conversation with his adolescent and teenage sons than I had to have with my son? I have ever sat and listened to a person of color describe what it was like to grow-up in America? “Not only will we have to repent for the sins of bad people; but we also will have to repent for the appalling silence of good people.” ― Dr. Martin Luther King Jr. There are sins of commission AND there are sins of omission. And I have to admit I have been part of the racist problem in America. I’m not as RACIST as I could be, I’m not as LAWLESS as I could be, I’m not as DEPRAVED as I could be, — but I’ve missed the mark in every area and I am desperately in need of God’s forgiveness. We can say that the spilled and spattered blood of Jesus made the New Covenant possible, and it also made it sure and reliable. It is confirmed, it is guaranteed with the life of God Himself. Because of what Jesus did on the cross, we have can have a new covenant relationship with God. In our contemporary culture, it is typical for non-Christians to say that the cross of Jesus Christ makes no sense. We can refuse revenge and forgive them. But to do THAT, we must suffer. We must suffer through the emotional and spiritual (and maybe physical) trauma. Do you see that? We can’t truly forgive a deep wound, a deep wrong without us absorbing the suffering. How much more must have God suffered in order to forgive us? How much more did God experience the obligation and debt and of every injustice and sin that was ever committed – past, present, and future?? Unless we come to grips with the doctrine of sin, we will not be able to understand the depths of what Jesus did for us on the cross. And therefore, we will not understand forgiveness in a way that will truly liberate us. On the cross, God’s love satisfied His own justice by suffering and bearing the penalty for your sin. There is never forgiveness without suffering. And when we see that with the eyes of our heart – we become both humble and bold at the same time. We are humbled by our having missed the mark by a mile – and we are emboldened the sacrificial love of God that changes us from the inside out. It is widely thought that the greatest human achievement of all time was traveling to and landing on the moon. When Jesus Christ accomplished the greatest act of love and redemption of all time—He ascended through the clouds and landed on heaven’s shore—what a celebration there must have been as Jesus returned to heaven victorious! In this post, we will be considering the Doctrine of the Ascension and, more specifically, how it secures our joy. Big picture, what this passage is telling us is that there are distinct stages of redemptive history. In this passage we see one stage transitioning to the next stage… it is a movement from the Incarnation, which establishes of the kingdom of God upon the earth as redemption is accomplished. In our passage today, we see this stage gives way to the Church Age stage. The goal of the Church Age is to spread the good news that the Kingdom of God has been established (but not yet consummated). This stage, that we are in now, will give way to the final stage where Jesus will come back – just as He left. When Jesus first told His disciples in John 16 (16:16ff  – The Farewell Discourse) that He would be leaving to prepare a place for them in heaven the night of His arrest, they reacted with great consternation, confusion, and concern, but then when it actually happened, we see in Luke 24:52-53 they responded with great joy and continuous (and I would add contagious) worship! So, we need to ask why?? What happened?? It seems that Jesus taught a 40-day theological intensive on the meaning and practice of the Kingdom of God. They needed to know that one stage of redemptive history was giving way to the next stage – the Kingdom established to the Kingdom proclaimed. It seems that after the resurrection the disciples began to connect many of the dots of Jesus’ 3-years of teaching — as well as their understanding of how the whole Old Testament actually points to Jesus (see Luke 24:27). Good theology stabilizes the soul – and prepares it for real joy. After the 3-year ministry of Jesus, after the resurrection, and after the 40-day theological intensive – the penny dropped, the dots were beginning to get connected, the fog was lifting. So much so that when Jesus was taken up into heaven 40-days after His resurrection there was now an exuberance, joy, and continuous worship! It seems the Apostle’s joy stemmed from intimate day-to-day knowledge of the Person of Jesus Christ as well as a growing theological understanding of who Jesus is, where Jesus went, and what Jesus was going to do. So, there are three questions we will ask: Who? Where? and What? One of the well-regarded Protestant catechisms is the Heidelberg Catechism. It was written over 17 years (1559-1576) to instruct youth as well as pastors and teachers. It’s divided into 52 sections (with a total of 129 questions and answers) so it could be explained in churches over a one-year period. How does Christ’s ascension into heaven benefit us? First, He is our Advocate in heaven before His Father. Second, we have our flesh in heaven as a sure pledge that He, our Head, will also take us, His members, up to Himself. Third, He sends us His Spirit as a counter-pledge [first fruits], by whose power we seek the things that are above, where Christ is, seated at the right hand of God, and not the things that are on earth. Grasping the Who? Where? and What? will open our hearts to new vistas of joy and worship. Who has Jesus become in His Ascension? Jesus ascended into heaven and has been crowned King of Kings and Lord of Lords and is sitting at the right hand of the Father. In this new stage of redemptive history, Jesus becomes our Redeemer-Advocate (supporter, defender, attorney). When John calls Jesus “our Advocate,” he means that our Redeemer now ruling and reigning His kingdom from the throne at the right-hand of the Father — to plead our case. Jesus’ work as our Advocate goes far above and beyond the work of an earthly defense attorney, because the “case” He is handling for us is grounded in the work He has done to secure God’s favorable verdict of innocence (see Romans 8:1–4). For those who are “in Christ,” God is no longer the Judge who condemns, but the Father who adopts the Christian into His family. We are all guilty of sin and unable to meet God’s demands of perfect obedience and perfect righteousness, but the perfect righteousness of Jesus imputed (not imparted) to us in our justification, which makes us right (or, righteous) before God. Practically speaking, Jesus’ work as our Advocate involves our once-for-all justification as well as Jesus actively praying for our ongoing sanctification — or transformation. Jesus ascended into heaven to sit at the right hand of the Father and as He becomes our Redeemer-Advocate – and our shame is replaced by His loving care – both covering our past and praying for our present. The second part of the Heidelberg Catechism answer says, “we have our flesh in heaven as a sure pledge that He, our Head, will also take us, His members, up to Himself.” What does that mean? Jesus is alive and sitting at the right hand of God the Father with all power and authority and He will one day come again in great glory. As Jesus rules and reigns from His throne, He is glorified, resurrected body. He is a single man, with fingernails, Mary is still His mother – you could shake His hand and ask Him how His day has been. What was Jesus going to do? We read in Acts 2 that the Holy Spirit was poured out 10-days after the Ascension. We call it Pentecost (i.e., 50th day). The Father and the Son pour out (or release) the Holy Spirit to both launch, empower, and build the Church. In essence, in this new stage of redemptive history, the Holy Spirit and Jesus switch places – Jesus goes back to heaven victorious and the Holy Spirit is released across the whole earth – as well as to live (habitate) in the heart of the Christian. The empowering presence of the Holy Spirit, being directed by Jesus, floods the whole earth to convict, to convert, to transform, and to build Christians into the Church. Jesus said it was better for Him to go so that the HS could come. It is better to have the Holy Spirit IN us than Jesus BESIDE us. After the Resurrection, another event was required in the history of redemption – another phase of redemptive history is now necessary to prepare for the final stage, which is the consummation and glorification of God’s Kingdom. The Ascension of Jesus Christ marks the completion of the work Jesus came to do on earth and the beginning of what He continues to do in and through the Church by the empowering presence of the Holy Spirit. Our joy is secured as we see that all of the majesty, grace, mercy, life, and power of God are wrapped-up in the glorious gospel and are firmly established by the fulfillment of the finished work of Jesus Christ. The Ascension marks the conclusion of one stage of redemption and the beginning of another. It is truly finished! And we await the consummation of the kingdom of God. #2: Electronic devices, #3: Domesticated fire, #4: Air travel, #5: Created writing, #6: Photography, #7: Theories of Relativity and Quantum Mechanics, #8: Theory of Evolution, #9: Created Music, #10: The internet. In John 16 Jesus promised the emergence of great joy—similar to the transformation of pain into joy when a mother gives birth to a child. Years later, the apostle Paul used the same metaphor—of our world being “pregnant with glory”—to describe life in Christ (Rom. 8:25) –Gospel Transformation Notes (John 16:16-24). Meaning to instruct in the form of a series of questions and answers. Reckoned, credited, assigned, ascribed – or, cloaked (see Is. 61:10).